This past year has been a series of tests after tests. As we enter the holiday season, I am reflecting on everything that’s happened this past year: health concerns for both my husband and myself, having Tween Girl gone for an entire month during the summer, College Boy being back home for the summer. All of those things were a handful, I made it through the anxiety and depressing feelings. Even with those issues, there was one constant that still reared it’s ugly head. One year ago, I accepted a new position at work. I won’t bore you with all that’s happened within the year with this job, just know that it’s been a struggle. During this time, my heart was not always grateful. I cannot tell you how many times I heard that. I have complained, cried, cursed and whined, trying to figure out how to cope. I was, according to Joel Osteen, bursting my own balloon. You know, shooting myself in the foot. Basically, blocking my own way. One year later, I can finally see how the complaining, crying, cursing and whining added to the person I am today. My new position at work did not come with training. In the past, I had always considered myself a self learner. This new position definitely put that to the test. I was not “catching on” as quickly as I thought I should have. After multiple mistakes, I found it easier to admit my mistakes and ask for help. In fact, Tween Girl helped me with this. She attended the Bring Your Child To Work Day at the company I work for and while watching me struggle with a spreadsheet says, “Mom, why don’t you ask for help?” A-ha, what a novel concept! There were so many times when I wanted to quit. In the past, there were so many things that I started only to quit them later. I knew that this time was different because I had set goals to accomplish certain things by accepting this position. One goal was to obtain the two certifications required for the job. It took me four attempts, but I finally got them! Of course, these are characteristics I want present in my life because I know that Tween Girl is watching me. As the parent, I want to help her grow these foundational pieces. Eckhart Tolle hit the nail on the head when he said this one. How could I help my situation if I only spoke negative words about it? All day long, my words were negative. Getting dressed for work, driving to work, in meetings, at the water cooler, driving home from work, at the dinner table (yeah, this is when I knew I had to stop). Complaining takes away from all the good in your life, totally negating the great things God has done and will do. I also found that I didn’t even need Eckhart Tolle. I had my own version at home! My Hubs showed me that he had my back because he encouraged me in so many ways to find other ways to cope without complaining. Can you imagine a world where we were all alike? Boring, right? The team I work with is comprised of many different types of personalities, which is needed in order to improve what we do. At times, these personalities would crash into each other. Other team members started to grow at faster rates than some, including me. When it came time to test for certification, one person passed both exams on the first try! *Hint: it was not me, see “perseverance” above for my victory. These words have been proven time and time again for me. Going through any struggle hurts and is painful but the key words are going though, not pitching a tent and living there. I wish that the past year went as smoothly as I described it within this blog post! If you’re like me, I like to keep quotes before my eyes, giving it my attention, not letting it depart from my sight. As such, I had to create a printable and share it with you. 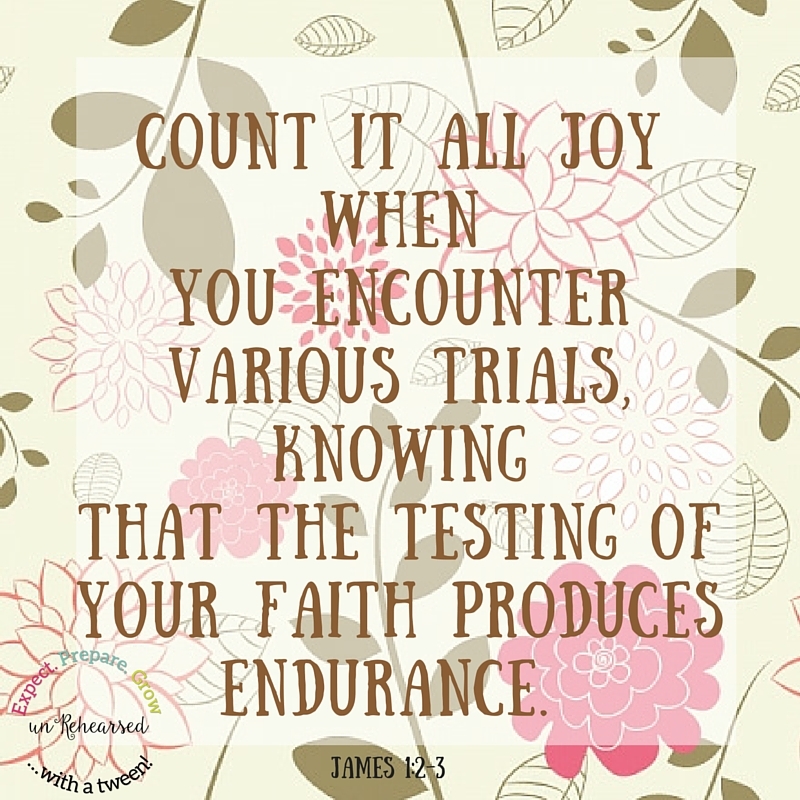 Click here to get your copy of Count it all joy. Take a pic to show me how you are displaying your copy, Instagram it to me! How are you cultivating your heart for gratefulness?